The teetering octave rocker mechanism, often referred to as “Selmer Style”, works well but is often very difficult to set up without lost motion. So much so, that many technicians believe it must have some lost motion to function correctly. Amongst the problems with the mechanism are the often slotted ends of the teetering rocker. By replacing the ends of this rocker with expandable Teflon balls, all play can be taken from this mechanism without needing oil or introducing friction. 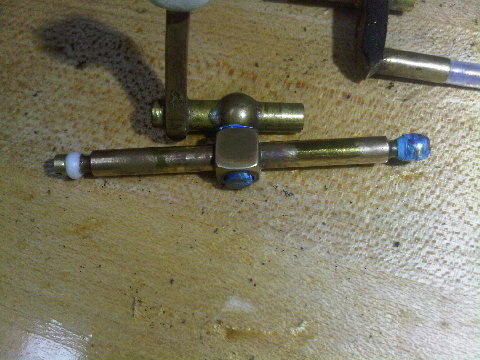 Here, you see an expandable Teflon ball has been installed on one end of the mechanism while the opposite side is still original. This is quickly becoming a popular modification for Selmer, Yamaha, Keilwerth, and Cannonball customers who have grown tired of the noisy octave mechanisms with lost motion.